The ModStore, short for Module Store, is a storefront available to all KnowBe4 customers that contains all of the training we have to offer. KnowBe4 partners with many e-learning and security awareness training organizations, allowing us to offer their content to our Diamond subscription level customers. What content is available in the ModStore? What kind of ModStore content can I add to training campaigns? Will I receive new content automatically? How do I add content to my Store Purchases? How can I filter content to find what I need? What do I do with the other content if I cannot add it to training campaigns? I'm a Platinum customer. Do I have access to all of the ModStore content? I'm a Diamond customer. Where is all my content? What does the "Retiring Soon" flag mean? What is the difference between "Retired" and "Archived" content? Can I download policies from the ModStore? Content is constantly being added to the ModStore. KnowBe4 partners with many different e-learning and security awareness training providers to offer a wide variety of content on many different topics. 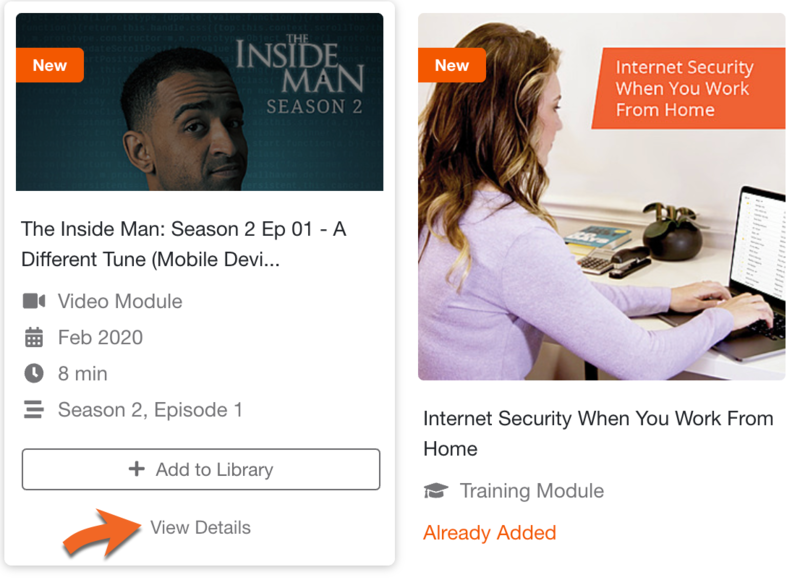 You can add any training (e-learning, interactive, compliance) modules, video modules, or games available at your subscription level to your Store Purchases. Once the module or game is available in your Store Purchases, you'll be able to add it to a new training campaign. To find out what is available at your subscription level and add new content to your account, follow these steps: How do I add content to my Store Purchases? New content will not be added to your account automatically. This way, you can choose to add only the modules and content that you need as you need it. You will be able to add new content to your Store Purchases as desired by following these steps: How do I add content to my Store Purchases? Navigate to the ModStore and look at the Subscription Levels header towards the right. There will be a black star next to your Subscription Level. Click the subscription level indicated by the black star to browse all of the content that is available at your subscription level. To add a new item to your Store Purchases, click the Learn more... button on any available course. From the Item Details page, you'll be able to read a description of the content, preview it, or choose to add it to your account. To add the content to your account, click the + Add to Account button. The item will now be available in your Store Purchases, beneath the Training section of your console. Note, if an item has an Already Added tag, the item is already available in your Store Purchases. What do I do with the other content (newsletters, images, etc.) if I cannot add it to training campaigns? The other available content can be used at your discretion to train your users. You can download the content and either email it to your users or host it behind your firewall. We recommend hosting it and then providing your users with a link to download and view the content if the content has a large file size. Our Platinum-level subscription provides you with full access to all of KnowBe4's product features and training modules and will continue to do so. The Diamond-level subscription will provide you with all of the above, but is a different product than Silver through Platinum and provides the value of a large content library that includes many different publishers in the e-learning industry. If you're interested in finding out how you can upgrade to Diamond-level, your Customer Success Manager will be happy to assist you. I'm a new Diamond-level customer. Will I be given any default content in my account? As of December 2017, new Diamond-level customers will have a "blank slate" in their KnowBe4 accounts with which to add the training content they desire. To see how to add content to your Store Purchases, click here. We consistently aim to offer the most up-to-date security awareness training content. This means our content will sometimes be replaced by newer versions. Typically, the "Retiring Soon" banner will be displayed on content that will soon be replaced by an updated version. See below for an example. NOTE: This image does not necessarily represent content that is nearing retirement. A "Retiring Soon" or "Retired" tag will display in other areas of the console–where the applicable assignments are located. For instance, under the Store Purchases tab, under the Campaigns tab when applicable assignments are included in training campaigns, and on the Create New Training Campaign page when you're selecting assignments from the Content drop-down menu. Navigate to Training > Store Purchases and click on the Retired category. Click on the Unhide icon to the right of the content title. However, we recommend updating to a newer version of the course if one is available. This way, we can provide support if you experience any issues. Archived content is content that is no longer available for use. You can view archived content in your Store Purchases by clicking on the Hidden or Archived category. Once a course is retired or archived, it will no longer be available in the ModStore. No, you create policies by uploading PDFs under the Training > Policies area. You can add these policies to training campaigns and require your users to accept or acknowledge these policies.